Commercial Officer Tom Hanson just completed his three-year tour at the U.S. Commercial Service in São Paulo. Brazil’s enormous offshore oil and gas finds, called the pre-salt fields, are located 200 miles off its southern coast and lie approximately 7,000 feet below the ocean’s surface. As these logistically and technologically challenging discoveries are explored, substantial business opportunities arise for U.S. suppliers of oil and gas equipment and services. Although Brazil’s largest oil player, Petrobras, has yet to publish its revised five-year investment plan for the 2015-2019 period, industry sources estimate that it may range between US$130 billion to US$ 140 billion. The exploration and production subsector should take 80% of the total planned investment. However, due to financial constraints brought about by investigations surrounding budget improprieties, Petrobras is likely to reduce its investment plan substantially, and may sell off some of its assets to offset its cash flow issues. As Petrobras has not yet issued its 2015-2019 equipment and services demand forecast, based on its previous Business Plan as of February 2014, U.S. providers of supplies and operating systems for platforms and tankers and manufacturers of workboats and transport vessels would stand a great chance of winning new business. Despite the current crisis involving Petrobras and its main turnkey contractors, Petrobras’ expansion plans may represent one of the world’s largest business opportunities in the oil and gas sector until at least 2020. Commercial Service (CS) Brazil counsels U.S. exporters who are not already established in Brazil to partner with a local firm that is registered as a supplier to Petrobras – a prerequisite – rather than attempting to register directly. Meanwhile, CS Brazil is engaged in the dynamic Renewable Energy sector. Brazil generates nearly 80 percent of its electricity from renewable sources – hydro, wind, solar, bio-mass, waste-to-energy – driven by both its immense renewable energy resource potential and rising energy demand. In fact, renewable energy capacity in Brazil is registering an average annual expansion of 12 percent, with special emphasis on wind energy, biomass from sugarcane, and small hydropower plants. To date, most U.S. exports have been in the form of services and high value-added products that are not available domestically. However, exports to Brazil are hindered by significant import tariff barriers. Brazil imposes a 14 percent tariff on wind turbines, component parts for the wind industry, and hydropower turbines; and a 12 percent tariff on imported solar equipment, both PV and thermal. CS Brazil can assist U.S. exporters navigate the complex path of market entry to find their niche markets and identify partners in these and other industry segments. Other, indirect costs of doing business in Brazil (referred to as “Custo Brasil) are often related to distribution, government procedures, employee benefits, environmental laws, and a complex tax structure. Brazil has a large and diversified economy that offers U.S. companies many opportunities to partner and to export their goods and services, and U.S. exports are increasing rapidly. For more information about export opportunities in these energy sectors, please review the Country Commercial Guide and Top Market reports. Fans are ready for the 2016 Olympics in Rio de Janeiro, and U.S. businesses should get ready for export opportunities related to the games. Athletes around the world have already begun their preparations for the 2016 Olympics in Rio de Janeiro. For U.S. businesses looking to take advantage of export opportunities, preparations should also begin now. The good news (for most of us anyway) is that preparations for businesses don’t require any sprints, hours in the pool, or extraordinarily difficult-looking skills on a pommel horse. Actually, the best advantage for a U.S. company looking to win in Brazil is help from the International Trade Administration’s Commercial Service. We have teams on the ground in Brazil actively working with U.S. industry to identify opportunities presented by Rio 2016 and overcome challenges to capitalizing on these opportunities. In addition, new infrastructure-related investments for the Rio 2016 Games will reach $15 billion, targeting major airports throughout the country, new transportation corridors and intelligent transportation systems, and port revitalization. Subcontracting opportunities will also be available to U.S. firms. The Organizing Committee for the Rio 2016 Olympic and Paralympic Games will also have a separate budget of $1.3 billion to acquire products and services such as temporary construction for sports venues, mobile equipment, video and broadcasting equipment, marketing, and catering services. U.S. firms, especially those with proven success at previous Olympics and major sporting events are welcome to bid. What this all adds up to is enormous opportunity for U.S. companies, and the Commercial Service team in Brazil is working closely with the Olympics Organizing Committee to make sure U.S. companies know about all of these opportunities. The first step for potential suppliers is to register at the Rio 2016 Suppliers Portal website. After registration, U.S. companies will be able to view all available tenders and steps to place a bid. for information about the games and bidding opportunities. U.S. firms can also directly visit the Rio 2016 website as well as the Rio 2016 Committee website for information. The Commercial Service in Brazil is ready to assist you in this process. Please feel free to reach out directly to CS Rio Principal Commercial Officer Mark Russell, mark.russell@trade.gov, or Commercial Officer Jay Carreiro, jay.carreiro@trade.gov for further information. World Cup fever plays a part in the expanding U.S.-Brazil commercial relationship. 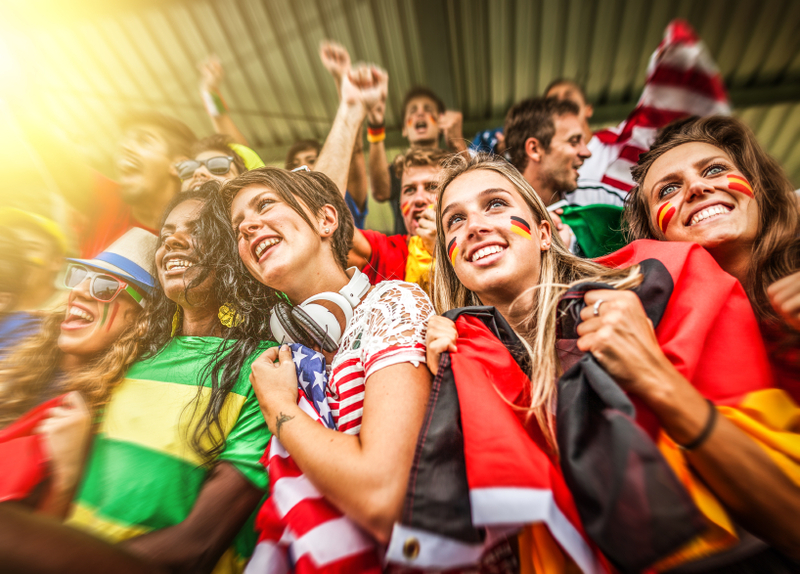 The FIFA World Cup is underway and all over the world, excitement grows as fans cheer on their national teams. In fact the Brazilian Federal Government reported that more than 150,000 tickets were assigned to the United States – more than any other country outside Brazil. By cheering on the U.S. team, fans are not only supporting players but contributing to the growing commercial relationship between Brazil and the United States. Like the United States, Brazil is mainly a service economy. In 2012, services comprised 68.5 percent of Brazil’s economy, compared to 78.6 percent of the U.S. economy in 2011. Brazil is a net exporter to the world and had a 2013 trade balance of $2.5 billion. In the same year, Brazil’s exports totaled $242 billion. As recipient of $44.1 billion of U.S. exports in 2013, Brazil earns a spot in the Top 10 U.S. Export Markets. Our top five exports to Brazil, are chemicals, transportation equipment, computer and electronic products, machinery (except electrical), and petroleum and coal products. U.S. and Brazil mutual foreign direct investment totals more than $80 billion dollars, supporting thousands of jobs in both countries. Even when world sporting events aren’t going on, the Department of Commerce, International Trade Administration (ITA), and other government partners work hard to further develop the U.S.-Brazil commercial relationship. ITA maintains five offices around the country, and our commercial specialists connect U.S. companies to qualified partners and promising business opportunities. You can learn more about the work ITA is doing in Brazil at http://www.export.gov/brazil, or follow our Brazil team on Twitter at @Export2Brazil. Stay tuned for more economic profiles on the countries competing in the World Cup! *Except where noted, all figures are from Trade Policy Information System. Alexis Haakensen is an Aerospace Industry Specialist in the International Trade Administration’s Office of Transportation and Machinery. Brazil is the world’s fourth largest domestic aviation market and has been a top 10 market for U.S. aerospace exports since 2004. Home to 3,500+ airports, more than 13,000 general aviation aircraft, and the biggest airline in Latin America, Brazil has opportunities for companies across the aviation industry. To introduce U.S. firms to this readily expanding market, the International Trade Administration (ITA) at the Department of Commerce is organizing a trade mission to Brazil from May 12-16, 2014. The mission is designed for U.S. aviation and aerospace manufacturers and service providers, particularly small and medium-sized enterprises interested in long-term business opportunities in Brazil, as well as the trade associations/organizations that represent them. This is the latest in a series of aviation programs with Brazil supported by ITA and the U.S. government. In 2012, the two governments launched the U.S-Brazil Aviation Partnership to foster closer ties in aviation between our two countries. During the past two years, government agencies from both sides have sponsored workshops, conferences, and industry matchmaking events to create new opportunities for industry. ITA has supported this initiative by providing webinars and supporting supply chain events and by advancing aviation policy issues under the joint recommendation of the U.S.-Brazil CEO Forum. We hope to see many U.S. aviation businesses taking advantage of this mission and the many opportunities available in Brazil. Posted in Trade Missions | Tagged aviation, Brazil, U.S. Aviation Partnership, U.S.-Brazil CEO Forum | Comments Off on Come Help Brazil Fly! Once every four years, the world gets a taste of world class soccer with the FIFA World Cup. For Greensboro, NC-based University Print & Graphics, the 2014 World Cup experience will include more than just watching the games. The International Federation of Association Football, popularly known by the French acronym FIFA, recently notified University Print & Graphics of approval for a product license. The company will be able to sell officially licensed hair bows at the World Cup in Brazil. Chief Operating Officer and Co-Owner Michael Brunson came up with the idea during a trip to South Africa to watch the 2010 World Cup. It took the firm two years to apply for and receive the license from FIFA. It’s a rigorous process to apply for such a license. Luckily, the company wasn’t alone – Debbie Strader and the International Trade Administration’s Export Assistance Center in Greensboro helped the business navigate through the license application. They worked together to make sure all parts of the export process had been taken care of, including finalizing product requirements, negotiating freight shipment rates, and securing legal representation. Strader also worked closely with the ITA team in Brazil, giving the company even more insight about doing business in the country. This license means a lot for University Print & Graphics and for Greensboro. The company expects to hire as many as 25 additional employees under a new division that will handle many aspects of the World Cup campaign. It’s a powerful team when it comes to exports – quality American products and ITA’s offices in the United States and around the world. We’d like to team up with your company too. If we can help your business increase exports, visit your local U.S. Export Assistance Center. Kit Rudd is the Senior International Trade Specialist responsible for Construction Machinery in the International Trade Administration’s Office of Transportation and Machinery. Brazil is becoming an increasingly important partner for the United States. U.S. Secretary of State John Kerry, Secretary of Energy Ernest Moniz, and Under Secretary of Commerce for International Trade Francisco Sánchez all visited Brazil in August to discuss growing U.S.-Brazil ties in trade and education. For U.S. exporters, Brazil’s machinery manufacturing sector represents an attractive opportunity. Taking advantage of that opportunity, however, requires familiarity with the country’s often challenging customs and tariff systems, local content requirements, and legal procedures for establishing a business. That’s where Achilles Arbex can help. 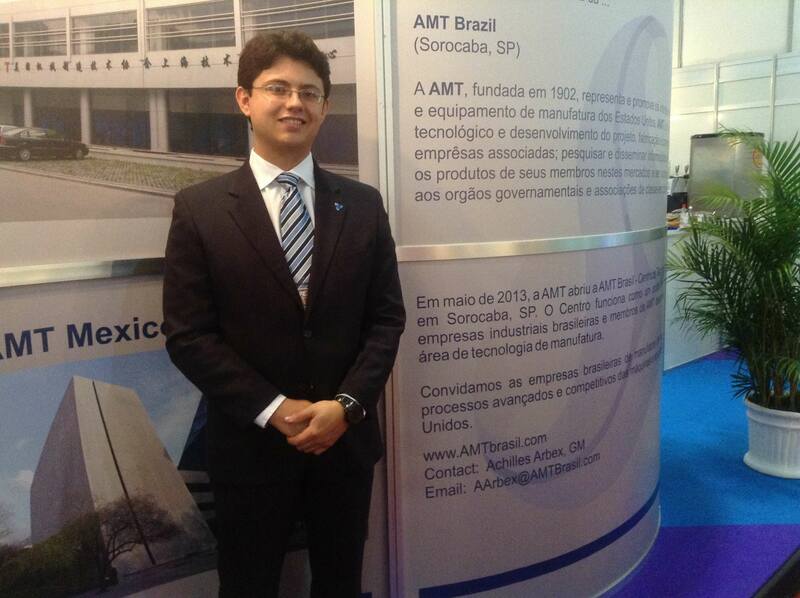 Arbex is the General Manager of the Association for Manufacturing Technology’s (AMT) Sao Paulo Technology Center. The Technology Center is the focal point of a $290,000 Market Development Cooperator Program (MDCP) award the International Trade Administration (ITA) awarded to AMT. The award is helping AMT represent and promote the interests of U.S.-based manufacturing technology businesses. AMT supports manufacturers that design, build, sell, and service the continuously evolving technology that lies at the heart of manufacturing. Our team recently spent five days with Arbex and AMT executives at the FEIMAFE Machine Tools Trade Exposition in Sao Paulo, talking to U.S. exhibitors about how AMT’s Technology Center can help U.S. companies take advantage of opportunities in Brazil. To help its member companies access emerging global markets more easily, AMT has opened technology centers in Shanghai; Chennai, India; Monterey, Mexico and now Sao Paulo. The MDCP award is a competitive program that provides funds to organizations aiming to increase U.S. exports. For every dollar given to an industry by ITA, the industry group must provide two of its own. As part of the award, ITA will work with awardees to help accomplish their mission. The Department of Commerce recently announced seven recipients of the 2013 MDCP awards. For more information about the awards, including how to apply for future consideration, visit: www.trade.gov/mdcp. Braeden Young is an International Trade Specialist and Brazil Desk Officer within the International Trade Administration. Brazil, which became the world’s sixth-largest economy last year, is bustling with activity. As Brazil ramps up preparations for hosting the 2014 FIFA World Cup and the 2016 Olympic Games, opportunity abounds for U.S. companies to support infrastructure development at sports venues, surrounding communities and commercial centers, and transportation hubs. The recent discovery of new oil reserves off Brazil’s coast presents new opportunities in the oil and gas sector. U.S. firms have specialized expertise in deep water drilling and related services and are well-positioned to partner with Brazilian companies to help Brazil reach its objectives. However, Brazil’s rise is marked not only by towering cranes and the roar of jackhammers, but also by smiling students and the scribbling of pencil on paper. Education is vital to Brazil’s long-term development and the market for education services here has never been better. Brazil’s economy grew 23 percent over the last five years, to nearly $2.5 trillion in 2011. Economic growth and industrial development has created demand for a better trained, more sophisticated workforce; Brazil hopes to expand educational opportunities for students in order to meet employer needs in commerce, high technology, and engineering. U.S. colleges and universities are ready to help Brazil meet these demands. Brazil’s population of nearly 200 million is easily the largest in Latin America. In recent years, tens of millions of Brazilians of have emerged out of poverty into Brazil’s middle class, which now represents over half of Brazil’s population. Now, more than ever, Brazilian students have the interest and means to study overseas, and they want to come to the United States! The United States is a top destination for Brazilian students studying abroad. 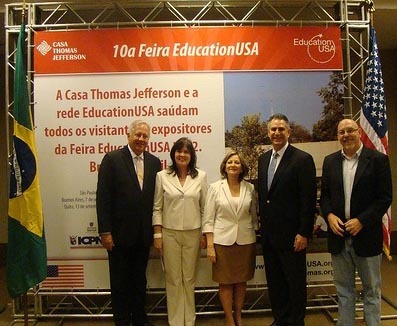 Since 2006, the United States has seen an increase in the number of Brazilian students. Nearly 9,000 Brazilians studied in the United States last year, a 25 percent increase from 2006, placing Brazil in 14th place among country of origin of international students in the United States. Tuition and living expenses for international students brought in nearly $21 billion to the U.S. economy last year. Brazilian students accounted for $257 million. New partnerships between our two countries will boost the number of Brazilian students on campuses across the United States. Brazil’s new Science Without Borders program illustrates the commitment of the Brazilian government to higher education. This innovative initiative aims send 101,000 Brazilian students and scholars in the science, technology, engineering, and mathematics (STEM) fields to study and conduct research abroad over the next four years. The United States is and will continue to be an important destination for these anxious young learners. Last week, Under Secretary for International Trade Francisco Sánchez led representatives from 66 U.S. colleges and universities to Brazil on the largest education mission in the history of the Department of Commerce. By talking with thousands of students in three cities (Brasilia, Sao Paulo, and Rio de Janeiro), we learned that Brazilian students are well-prepared and anxious to study in the United States. We also learned from the school representatives that the Brazilian students already studying in the United States bring a unique energy to their campuses. These U.S. schools look forward to hosting even more young Brazilians going forward. Increased educational exchanges between the United States and Brazil will enhance mutual understanding, strengthen our commercial and strategic ties, and benefit our economies. Education is a win-win opportunity and we are proud to promote the U.S. higher education system to Brazil and the world!